Menu planning is a pain. I am all about the tips and tricks to minimize the time and brain-power we pour into menu planning. It’s something we need to do, something we need to become consistent with, but it doesn’t have to drain us or take an entire Saturday morning. We can streamline things and make it simpler. One tool I use to streamline a lot in my life is Evernote. Here’s how it helps my menu planning routine. Simplified Dinners comes with an Evernote-ready edition when purchased along with Paperless Home Organization. So, in my own Evernote account, I have a Simplified Dinner stack. It contains a (searchable) copy of Simplified Dinners, but also a section for saved recipes – mostly recipes I have clipped from the internet and sent straight to the program, where it’s available on all my computers and devices. I also have holiday notebooks with seasonal recipes. Again, most of these recipes are off the internet, and with a click of a button, an ad-free, side-bar free version is safely stowed in my account for next year. Evernote holds my master grocery list. I already answered that question and all I have to do is open up my master pantry list on my phone and head to the store. Cut and paste my master list into the note on that task, then tap & delete each item I already have on hand. OR I only cut and paste over the items we’re missing. Pull up the task on my phone and away we go. Working from a master list rather than a menu plan with random recipes that has to tied to the list makes it faster and simpler to keep the cupboards stocked. Evernote could hold your menu plan. Now, I do not keep my menu plan week by week in Evernote, but you definitely could. In fact, if you did, you could easily have rotating menus and reuse previous plans. You’d simply start a new note for the week and list out your planned meals. On the morning of each day, pick the meal off the list that you’ll make. The list won’t get lost, won’t get coffee spilled on it, and won’t be scribbled on by the toddler (at least, we hope not). I put my menu plan in Google Calendar, but Evernote is another great option. Let me show you how to be awesome with Evernote. Evernote is the perfect place to begin using technology to make life run more smoothly. Learn how to use Evernote for homemaking, managing the family, and homeschooling. Move to a more paperless information storage routine to reduce the clutter. See how technology can work for you, even if you aren’t techie yourself. 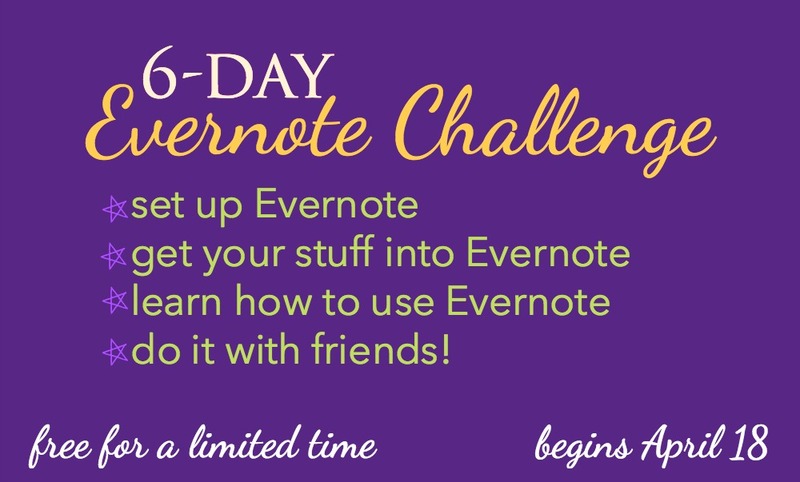 Join this 6-day Evernote challenge and grow confident and efficient in how you use the program! Designed for moms less comfortable using apps and digital solutions, this course will walk you through how to first set up Evernote in a clear and organized way, then teach you how to use it effectively and simply. Evernote is easy to overcomplicate. But it can be a simple, powerful solution without fuss or complexity. Short screencasts make it clear what to do. Bulleted action items make is simple to follow along. A low-key, humorous style makes it low-pressure and low-stress. I’ve been using this information powerhouse for over 6 years and I’ve learned all the tips and tricks to make it a powerful tool in my home management arsenal. I use it for menu planning, holiday planning, homeschool lesson planning, homeschool record-keeping, receipt recording, and as a general information receptacle. Evernote is so useful, but not the most intuitive program. Let me make it intuitive for you! Just curious. Have you ever lost all your info because of tech glitches? My biggest stumbling block to using technology for some of this stuff is watching my friends lose their data/projects and have to start over. Hi Jenny – no, I haven’t, but that’s because my husband is a techie and makes sure our computers are auto-backed-up daily and keeps our computers updated and upgraded as needed. Also, the nice thing about Evernote is all the data is also backed up on their end.